Stephanie Patella (‘20) is an 11th grade student who has embraced her new home at Fontbonne after transferring from St. John Villa in Staten Island this school year. 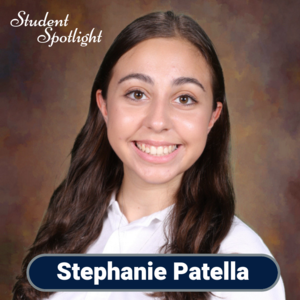 While maintaining her honor roll status, Stephanie engages in a number of extra-curricular activities both within and beyond Fontbonne. Stephanie is a member of the Drama Club and has a leading role in the school’s upcoming Spring musical, Hairspray. She is no stranger to the stage, having performed in all 4 musicals while at Villa. Stephanie passes on her love for the theater to Staten Island youths through her work as a Director's Assistant for Sundog Theatre's Performance Training Program for youths 9 -14. Stephanie also volunteers some of her weekend time to Meals on Wheels, delivering food and much needed human interaction to elderly people across Staten Island. Upon her arrival at Fontbonne, Stephanie has been able to expand her love for performing in new ways. She is a member of the Speech Team, and based her high placement in a number of competitions, she has qualified for the Statewide competition later this year. Additionally, Stephanie has taken full advantage of Fontbonne’s Broadcast Journalism Program. Stephanie is Associate Editor-in-Chief and a contributing writer for the Folio (the school’s on-line newspaper). She also anchors newscasts for BNN (the Bonnie News Network). Stephanie will get the chance to enhance her growing interest in journalism this summer, as she has been selected to represent Staten Island as a National Youth Correspondent to the 2019 Washington Journalism and Media Conference at George Mason University in Washington D.C. She joins a select group of students from all over the country for an intensive, week-long study of journalism and media that will involve hands-on, experiential learning as well as guidance and instruction from well-known leaders in the media community.